Have you ever felt like your life is a constant shift from one commitment to the next? As soon as one meeting finishes, another is about to begin. In the open spaces of your calendar, you do your best to keep up with your inbox, respond to texts, and answer the call of social media. I’ve been there, putting myself in a position where my obligations were in charge of my attention. One of my goals in mini-retirement is to take back my schedule (and my sanity) by shifting my actions from “push” to “pull”. Here’s how I’m doing it - starting with one little experiment. First let’s get some definitions out of the way. What are push actions and pull actions? Push-based actions are reactive - answering an e-mail or phone call, replying to a text, liking a post you’ve been notified of, or accepting a meeting you were invited to. While push actions are effective at accomplishing someone else’s agenda, they aren’t always effective at accomplishing your own. Push actions can drive information you didn’t ask for and imply the need for an action you weren’t planning on. If framed in the wrong way, push actions bypass the part of your brain that asks whether your action is worth it. Here’s an example: what’s your default mode when you get a meeting invite at work? Most people I know accept any invite that comes their way as long as it doesn’t conflict with another one. But is it the best use of your time? Not usually. How many hours of pointless meetings have you suffered through? That meeting could be keeping you from much more valuable, intentional actions, but if you auto-accept that meeting, you’ve auto-declined that other valuable work. Pull-based actions are on the opposite end of the spectrum. These are the proactive things you do because you believe they will provide value. This could be brainstorming a new idea in your job and giving it a test run, reaching out to a friend you want to maintain contact with, or planning out a fun day for your family at the zoo. Pull actions are loaded with intention because you were the initiator. Pull actions use your creativity and energy toward the things you believe will make a positive impact. I’m a part of the “Oregon Trail Generation” - the older millennials that remember what life was like before widely-accessible internet and cell phones. I held off on getting a cell phone in part because they were expensive and I didn’t want people to assume I was always available and ready to answer their call. I finally caved in my senior year of college and the tech junkie in me loves the accessibility and functionality that app stores have brought to the palm of my hand. Over the years, though, app developers have become incredibly good at taking advantage of push notifications on our phones to demand our attention. I’ve got 80 apps on my phone competing for my eyeballs - and they don’t just want it when I’m staring at my phone. They want my attention in the middle my kids’ dance recitals, in the middle of a date with my beautiful wife, and even in the middle of the night. 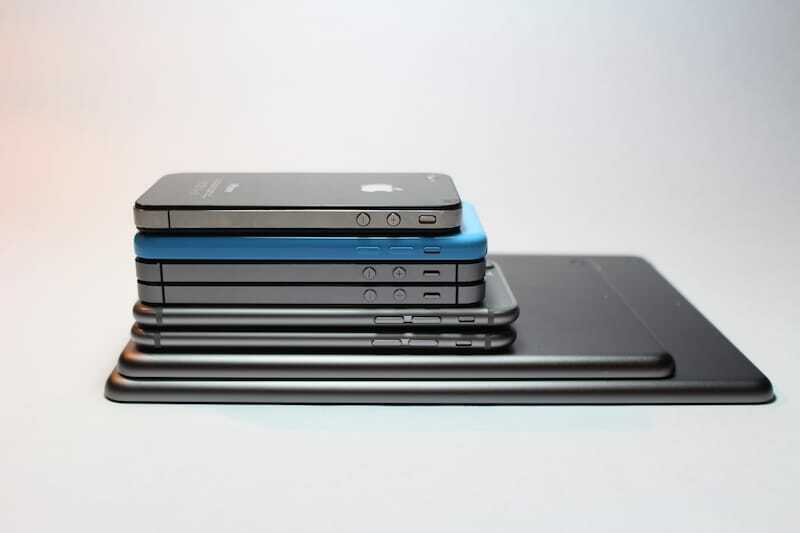 As a result, Americans check their phones, on average, 46 times a day. That’s once every 21 minutes if we’re only checking when we’re awake. It’s gotten so bad that we’ve created a term - Phantom Vibration Syndrome to describe that feeling of your phone vibrating in your pocket that turns out to be a false alarm. According to one doctor, a more appropriate way to term this is a tactile hallucination. Think about that for a second. Our phones are demanding our attention to the point that we are having hallucinations. So, after reading an article about the benefits of turning off push notifications, I’ve spent the last month experimenting with one more form of minimalism - minimal pushes. I went into my phone’s settings and disabled notifications (visual, audio, and tactile) for every app with a few exceptions. My list of apps with no notifications includes: e-mail, social media, banking, blog feeds, YouTube, Skype, and others. It means I check my e-mail when I’ve got the desire to do so and the time to focus. It means I check Twitter and my other social media accounts when I’ve got the desire to do so and the time to focus. It means I check my bank accounts and blog feeds when I’ve got the desire to do so and the time to focus. As a result, I look at my phone much less frequently these days. I’m less prone to pick it up just to see if a notification is there. I know there won’t be. I’ve found myself leaving my phone on the counter more often, opting to be completely disconnected. Sure, this means that my response to emails or tweets might come a little bit later. When we sit at the dinner table, I’m more engaged and focused. When I’m waiting for one of my daughters to finish brushing her teeth, I’m much more likely to joke around with the other two rather than find a quick distraction. It’s been awesome and I can’t imagine going back. Dwight D. Eisenhower, the 34th president of the United States, is pretty well recognized for being an insanely productive guy. One of his cornerstone strategies is the concept of the “Eisenhower Box”. Based on the combination, each task falls into a quadrant that dictates what you should do. Tasks that are urgent and important are crises that clearly need to be handled. Tasks that are not urgent and not important are a complete waste of time. Where it gets interesting is in the other two quadrants because these reveal a lot about our human nature. Tasks that are urgent often appear important even when they are not. A ringing phone is a great example. You have no idea who or what is on the other side, but the sound of a phone ringing is urgent enough to elicit an answer from most people. Tasks that are not urgent often appear unimportant. After all, if they aren’t staring you in the face, they can probably be put off, right? Tasks that are not urgent are often the most important tasks you can invest in. 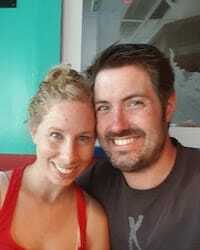 Spending time cultivating relationships with your spouse and kids. Spending time investing in your skills, your faith, or your health. All of these are really important but usually are not urgent until it’s too late. 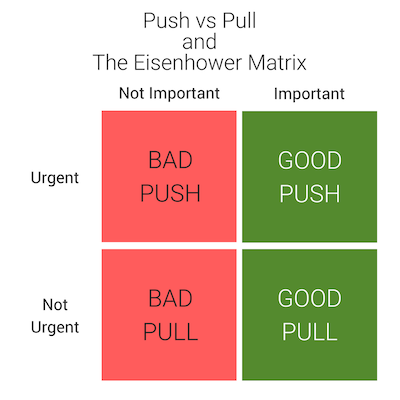 The key to long-term productivity is to apply push and pull in the right ways and the Eisenhower Box is a great tool to help us. Here’s my take on the Eisenhower Box, building in the concepts of “push” and “pull”. See below for an explanation of each quadrant. These are crises - handle them immediately. By their urgent nature, these are “push” but in an important way - you need to take action. Take note of what led to the crises and see if there are things you can do to prevent them in the future (note: prevention activity sits in the “Not Urgent but Important” quadrant). Examples: Medical emergency, fire, anything that immediately threatens yourself, others, or your livelihood. Some say that these are things that should be delegated or automated. I have a modified take on this. If they truly aren’t important at all, they should be eliminated and any push mechanisms that bring these to your attention should be silenced. These are the bad kind of push in your life. Build filters to remove the things that are unimportant and delegate or automate the rest. Eliminate these altogether. There’s no reason for you or anyone else to spend your time on these. With the time you save in eliminating tasks from the “Not Important” quadrants, you should be able to spend more of your time here. The awesome thing about this is that time in this quadrant often reduces the number of “Important and Urgent” crises you’ll encounter. If you take care of your health, you won’t be as likely to have medical crises. If you’re careful with your money, you won’t be as likely to have financial crises. If you invest in your relationships, you won’t be as likely to have emotional crises. If you work on building your faith, you won’t be as likely to fall apart when crises arise. As you go throughout your day, try to ask yourself whether what you’re doing is urgent, important, both, or neither. Apply the Eisenhower box and suppress the “pushes” that don’t lead to important activities. If you want to make the switch from push to pull, I recommend starting with your phone. It’s likely one of the biggest attention hogs you’ve got. It’s worth trying out for a few weeks to see what the impact is. Once you’ve tackled your phone, start looking for other areas in your life where you can move from push to pull. Once you’ve got more control over your attention, you can use it with more intention (Tweet this ) . Have you made the switch from push to pull with your phone or any other area of your life? How would you recommend others move into more of a pull-mindset?